The New Year is upon us, and it is a typical time for reviewing the past, changing directions, setting goals and moving forward for the year. Both the strategic leader and the operational doer in me challenge this notion quite a bit. In fact, I think it’s always a great time for listening and reflection, making thoughtful changes and adjusting the way forward. A lot happens throughout the year and we all need to be ready to realize when things aren’t working quite right and to seize opportunities as they arise. As many of you know, this first week of 2016 is my last as the President and CEO of ORION. I reflect fondly on how much ORION has evolved over the years. I have enjoyed working with all of the diverse customers and stakeholders that I’ve had the privilege to serve. There is no “good time” to leave any organization, but I do know that ORION is the best it’s ever been—and that’s as good a point to move on from as any. ORION has a fantastic, fast and reliable network and a set of growing ORION Nebula cloud services. Even more important is that the organization is in great hands with an outstanding team to serve our users. Indeed, we’ve come a long way but, more importantly, there is clear direction going forward. Over the last year and a half, ORION embarked on its Nexus Project to do some really deep, long-term strategic thinking. Over 500 of our users were engaged in providing ideas and feedback. And it’s all helped shape our collective future. ORION was able to implement some of those ideas during the last few months, and many have formed the key strategies for our near future. Just before the holidays, ORION released a summary report of the Nexus process, highlighting some of the early accomplishments and a brief outline of “what’s next.” As with all of ORION’s reports, you can find them online on our website (a shameless plug for you to visit our publications library). Speaking of “what’s next,” this week also marks the delivery of our 2015 Snapshot, ORION’s annual report. I have to say that it’s even better than last year’s. As with any annual report, it outlines what happened over the past year. 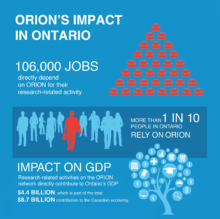 But it’s not just about ORION itself: it celebrates the wonderful accomplishments of our users—researchers, students, organizations, partners—and their direct impact on the people of Ontario. That is the true measure of success in what ORION does. I hope that when you read your copy of our Snapshot, Next, that you will be amazed at what has been achieved. The 5 Cs of ORION—Connectivity, Computing, Content (data), Cloud and Community—have stood the test of time. The 2015 Snapshot tells stories about each of those C elements and how they intersect. Our strategy clearly reflects those same elements. Today, those 5 Cs almost seem obvious, but they need to be continually reinforced in order to create a cohesive digital infrastructure for Ontario’s future. To me the most important C is the Community. We live in a world in which everyone needs to work together. It is only through cooperation that we can actually make things better for ourselves and for everyone around us. It is on that final note of collaboration that I would like to draw my time at ORION to a close. I wish everyone all the best for 2016 and well into the future. May you constantly strive to make things better…and do that every day of the year, not just the first few.